Restaurants In Sarasota has moved our news feed updates to Facebook which are embedded below. You don't have to be a Facebook subscriber to read the blog entries. (Sept. 1, 2010): The Table will be opening in two weeks on Phillippi Island in the former fish wholesale building near Phillippi Creek Oyster Bar. Pedro will be back in the kitchen and Rafael in the front of the house, along with many of the former staff from Hillview St. If they stick to the food they had at Hillview St. which made them popular, they will be successful. (Sept. 1, 2010): 1603 N Tamiami Trl. A location that has housed a number of Italian restaurants and even a hookah lounge, (Aristo) is scheduled to open Oct. 1 as El Pescador. (Sept. 1, 2010): Rumor has it the Irish Rover is planning on opening in downtown Sarasota. Their Gulf Gate location has closed. (Sept. 1, 2010): Solarzano's Italian will be open shortly in Gulf Gate across the street from the former Brocollini Italian restaurant. 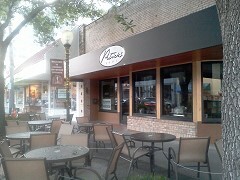 (Sept. 1, 2010): UPDATE: Shaner's has taken over the former Horse Feathers location in downtown Sarasota. Shaner's has closed the location at Clark & Beneva. (Aug. 19, 2011) Zante Gyros opened yesterday in Gulf Gate. The big move is on after 1/4 century at their old location. Patrick's is opening the first weekend in May at 1481 Main St. in downtown Sarasota. Just the opposite end of the block from their previous home of 25 years and 4 months. The great burgers will be back and look closely at the decor which will be a tribute to various Sarasota arts events and organizations. Being next door to Mattison's City Grille and across the street from The Gator Club should add more excitement to the already busy Lemon and Main area. 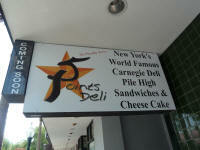 Under construction in the old Pattelini's Pizza location is the 5 Pointes Deli. If the sign's promise holds true, it will be nice to see a deli open up at that end of Main St. It's just next to the old Patrick's location. Part of the construction includes adding seating and an entrance in the small lobby adjacent to the restaurant as well as moving the front door back about 10 feet to allow room for outdoor dining. With the opening of a new Patrick's comes the closing of the nearby Olive Tree Cafe & Bar 1454 Main St.. It started with a lot of promise, but rumors of staff problems and inconsistent food led to another untimely restaurant closing. Executive chef Ryan Boeve and pastry chef Arthur Lopes, both formerly of Zoria, are back at the new Pomona Bistro & Wine Bar at Citrus Square in Downtown Sarasota. The restaurant promises to use local ingredients from nearby farms and fishermen for their menu. The restaurant wine list features wines from California, Oregon, France, Italy and Spain. The Table, formerly in Southside Village on Hillview Street, will be returning to the Sarasota food scene. They will be located on Phillippi Island on South Tamiami Trail. Good luck to Rafael and Pedro. We'll keep you updated on their opening plans. Congratulations to Tommy Kouvatsos (Village Cafe) and George Nikias (Millie's) on the opening of their new restaurant Legacy Sarasota Grille. A soft opening was held Sunday Nov, 8, 2010. Several hundreds guests attended and enjoyed food from the new restaurant's menu. While there are some items that will be familiar to patrons of Big Al's (that previously occupied the same location) there are a number of new items. Despite the crowd at Sunday's opening, food seemed to be coming out of the kitchen at a good pace. The operator's previous experience in restaurant management was obvious. Good luck in your new venture. Is Gulf Gate Sarasota's Little Italy? So when you have a craving for some prosciutto, pizza, pasta or cannoli, just head over to Gulf Gate. Where are people spending their money? According to an American Express study of cardholder spending, the wealthy are spending more in fast food restaurants today. As reported in The Wall Street Journal, the "ultra-affluent" are spending 24% more at fast food restaurants than a year ago while other consumers are only spending 8% more on fast food. According to American Express: "...ultra-affluent consumers nationwide increased spending in quick service restaurants by 24%, compared to a 12% increase for this group in fine dining spending. When compared to smaller spending increases in other categories, it is interesting for the food and beverage industry to note that less expensive restaurants have caught the attention of this particular consumer group." Bob's Boathouse returning? Rumor has it that the folks behind Bob's Boathouse, formerly at the end of Old Stickney Point Road on Siesta Key, are involved in the plans for a new restaurant to be built on the site of the former Carl Black GMC dealership on Phillippi Creek. Stay tuned for more details! According to published reports, Libby's Cafe & Bar in Southside Village has filed a lawsuit against a Lakewood Ranch based magazine due to a rumor they published recently claiming that Libby's was planning on closing. According to Libby's owner, that is not true. RestaurantsInSarasota.com has visited Libby's many times and judging by the crowds one wonders how the rumor could have started in the first place. According to a study from Yale’s Rudd Center for Food Policy & Obesity, the fast food industry spent more than $4.2 billion on marketing and advertising in 2009, focusing extensively on television, the Internet, social media sites and mobile applications. According to the study, preschoolers see 21% more fast food ads on TV than they saw in 2003, and somewhat older children see 34% more. 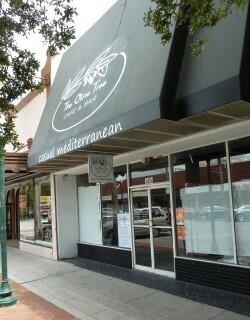 The Olive Tree Cafe & Bar opened on Main St. in downtown Sarasota. Owner Tony Tannus says it will be a Mediterranean cuisine offering Lebanese and Israeli foods featuring hummus, baba ganoush, etc. Tony says they'll even have mama ganoush! More and more cities and towns have banned smoking. Now Boston joins the trend as smoking is banned at all indoor workplaces citywide, including some 700 bars, restaurants and nightclubs. Watertown, Saugus and Framingham have also gone smoke-free, joining a growing number of cities around the country. New York City is enforcing its ban. In Massachusetts, 77 communities have adopted total public smoking bans, and many others have partial bans. While public health officials, many nonsmokers and smokers alike say they'll appreciate the fresher air in Boston now, business owners and patrons are concerned about loss of business and ambiance, and what they feel is an infringement on their rights. Tax receipts in Florida showed that business at restaurants actually increased after Florida's indoor workplace smoking ban went into effect several years ago.